Brad Huff played well enough in high school to selected by the Cubs in the fourth round of the draft, Huff not even 18 years old. Huff turned pro. He also turned 18 that July. As a pro, though, Huff couldn't turn that early faith the Cubs showed him into a long career. He ended up playing in just four seasons, making it to high-A Winston-Salem, but no higher. 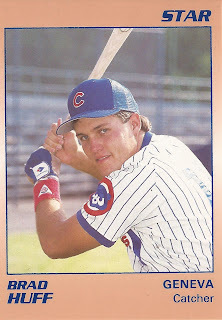 Huff's pro career began that year in 1988, taken by the Cubs directly out of Monroe Area High School in Monroe, Ga.
With the Cubs, Huff signed in time to get into 12 games at rookie Wytheville, the catcher hitting .231, with a stolen base. Huff returned to Wytheville for 1989, this time getting into 42 games. He hit .212, knocking in 11 runs and stealing two. For 1990, Huff moved to short-season Geneva, getting 39 games there. With Geneva, Huff hit .279, knocking in 14 and stealing four. Huff's fourth season came in 1991, Huff going to high-A Winston-Salem. But it was a short season. Huff played just seven games, getting eight at bats and no hits. It was his final season as a pro. Huff appears to have since returned home to Monroe Georgia, listed with the athletics division of the Walton County Parks & Recreation Department.